Mushroom Platforms (originally known as Super Mushrooms) are giant mushrooms that appear throughout the Mario franchise. True to their name, they are typically used as platforms. In most 2-dimensional games, they specifically work as Semi-Solid Platforms. They are most often found in large clusters in athletic levels. Short, squat versions also appear in some games. 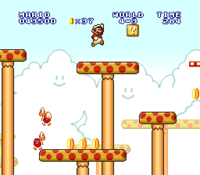 Super Mario Bros. introduces Super Mushrooms in World 4-2's Warp Zone and World 4-3, replacing the similar tree-like platforms other athletic areas of the game have. In these two areas, the green or gray secondary scenery palette that overworld areas in the game normally have is replaced by a red and orange palette for the Super Mushrooms, causing the Warp Pipes and Goal Poles in these areas to appear red and orange themselves. This detail is no longer present in the Super Mario All-Stars rendition of the game, as more palette slots are available at once. 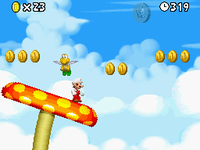 Additionally in this version, other Super Mushrooms can be seen in the background of World 4-3. Unlike later 2D games, the Super Mushrooms here are solid on all sides, meaning they cannot be jumped through. They are completely absent in Super Mario Bros: The Lost Levels, with the secondary athletic platform instead being lengthy clouds, found at the end of World 8-2 (since the Goal Pole can only be accessed via Beanstalk), in World 8-3 (which takes place in the sky), and in World A-3. However, they do appear in All Night Nippon Super Mario Bros., where their stalks are broken up into segments. Additionally, the red and orange secondary palette used for them appears in several levels in all but the Super Mario All-Stars version. In Super Mario Land 2: 6 Golden Coins, Mushroom Platforms resembling the ones from Super Mario Bros. appear in Pumpkin Zone Special Area 2, where they now have striped candy-cane like stalks. Wide, blocky Mushroom Platforms additionally appear in Tree Zone Special Area and Pumpkin Zone Special Area 2. Mushroom Platforms in Super Mario 64 DS. 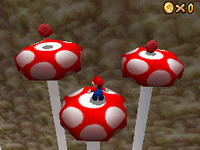 In Super Mario 64 and its remake, Mushroom Platforms appear in Tall, Tall Mountain. They are mentioned in the titles of Scary 'Shrooms, Red Coins and Blast to the Lonely Mushroom, which are the missions they are most directly involved with. Some also appear on the painting to the world. In Super Mario Sunshine, Mushroom Platforms make up all of the ground on Pianta Village's underside, below several climbable nets. One of them contains a secret area full of Piantas called "Chucksters." In Pianta Village itself, several red ones have grown through and seem to be used as torches, as they are commonly found with a flame on top. Extinguishing it usually causes a coin to come out. One of the Mushroom Platforms in the town has a golden cap, and is where the mayor is trapped in The Goopy Inferno. Mushroom Platforms are found throughout the athletic levels of New Super Mario Bros., now being the primary platform for the level type. They first appear in World 1-3, where they come in orange or green, both with yellow spots. Additionally, purple ones can be found later in the game. While most are stationary, some sway back and forth, occasionally moving across the screen while doing so. Several specialized versions appear in the game as well, such as a pink, bouncy one known as the Mushroom Trampoline, as well as a blue type with an expanding and contracting cap, and red and yellow ones that move up or down if stood upon. In New Super Mario Bros. Wii, Mushroom Platforms have even more color variation, and first appear in World 1-5. They also notably appear in World 8-1, despite it being a lava-based level. Like the previous game, this game features specialized versions of them, such as a purple type with a diamond patterned-cap with a screw on top and a corkscrew-like stalk. By spinning on these, the height can be adjusted. Additionally, the type with an expanding and contracting cap reappears, now pink. In many athletic levels, large spinning cubes with mushroom-like spots appear alongside Mushroom Platforms. In New Super Mario Bros. 2, Mushroom Platforms appear again, looking and acting like they did in New Super Mario Bros. Wii. They first appear in World 1-4. In World 4, their caps appear covered in snow. Mushroom Trampolines reappear, now with yellow spots, as do the rising and sinking ones, now magenta and cyan, and the pink stretching ones. Mushroom Platforms appear with even more color variation in New Super Mario Bros. U, where they are first found in Mushroom Heights. In New Super Luigi U, they are instead first found in Piranha Heights, the level's direct replacement. The pink stretching type also reappear in the game. The game also introduces a seesaw-like variant in the level called Seesaw Shrooms. Mushroom Platforms appear as placeable objects in Super Mario Maker and Super Mario Maker for Nintendo 3DS, where they are given new graphics for the Super Mario Bros. 3 style. For the Super Mario World style, their tiles are repurposed from those of the large generic spotted platforms found throughout that game. Their height and length can be adjusted in the level editor. When Mushroom Platforms are placed underwater, their appearance changes to resemble coral. 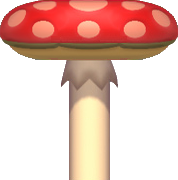 When they are placed in airships in all styles except for New Super Mario Bros. U, their stalks change to look mechanical, and in the Super Mario Bros. style, the cap becomes metallic. In each style, shaking them changes their color between being primarily red, yellow/white, or green. Mushroom Platforms return in the game's successor, Super Mario Maker 2. Mushroom Platforms appear in Super Mario Run, as platforms in the levels Paratroopas in Mushroom Valley and Lakitu's Revenge. Mushroom Platforms also appear in Super Mario Odyssey, in an 8-bit section in Bowser's Kingdom, having a more realistic look and tan and brown color. Standing on them causes them to sink into poison. The skinny type of Mushroom Platform from Yoshi's Island: Super Mario Advance 3. All three sizes of the thicker type of Mushroom Platform in Super Mario World 2: Yoshi's Island, along with some similar lollipop-like structures. In the Yoshi's Island series, Mushroom Platforms first appear in Super Mario World 2: Yoshi's Island. In this game, Mushroom Platforms appear in cave levels, with many having much thinner stalks and caps, which curve around more than the blocky squarish ones from most Mario games. They come in multiple colors, such as red, blue, beige, and purple, and have a whitish center area instead of spots. Thicker ones with triangular caps also exist, and do have spots. Smaller examples of these can come in other colors, such as dark mahogany and dark pine green, while even smaller than that are limited to blue, red, beige, and purple, like the largest ones. Most of both types appear to have a slice out of the cap, but the smaller two versions of the latter type lack these. Mushroom Platforms appear in the backgrounds of the Mushroom Kingdom stage of Super Smash Bros. (where they are green rather than orange) and the Mushroom Kingdom stage of Super Smash Bros. Melee. They also appear in the Golden Plains and Rainbow Road stages in Super Smash Bros. for Nintendo 3DS. Platforms in the former stage are pass-through platforms, while platforms in the latter are not, as it is one of the stage's main fighting arenas. Red and green Mushroom Platforms from Mario Kart Wii. In the Mario Kart series, Mushroom Platforms first appear as a cameo in the background of Mario Circuit in Mario Kart: Double Dash!!. Mario Kart Wii features a track themed after them, Mushroom Gorge. Green Mushroom Platforms are standard platforms, while the player can bounce off the red Mushroom Platforms, and can glide off of blue Mushroom Platforms, the last of which only appears in the Mario Kart 7 Retro Course. In Mario & Luigi: Superstar Saga, Little Fungitown is a town built atop several Mushroom Platforms, along with several of the tree-like platforms from Super Mario Bros.
For this subject's image gallery, see Gallery:Mushroom Platform. ↑ Hiroo Tochikubo, How to Win at Super Mario Bros., Tokuma Shoten, 1987, ISBN 4-19-720003-XC. Page 6. This page was last edited on April 24, 2019, at 16:44.